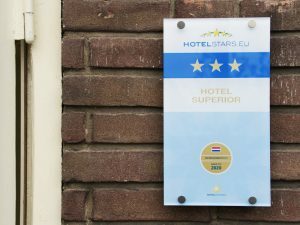 Hotelsterren (Translated: Hotelstars) audits hotels according to the European Hotel Classification. Only participating hotels, which are classified according to the official European standardization, may carry the starshield. With this register Hotel Stars clarifies the difference between hotels and their services and facilities. This will help the customer to discover what is important for them in a hotel, and they can check if the hotel will meet their expectations. Hotelsterren is an initiative of Koninklijke Horeca Nederland (Royal Dutch Hospitality), which holds the official Dutch Hotelstar Classification and is a member of the European Hotelstars Union. They have all official classification information from accommodation providers in Europe. The implementation of the Dutch and European Hotel Classification has been entrusted to ‘Het Centrum voor Publieke Innovatie’ (Center for Public Innovation) under the name of Hotelsterren. The hotels registration will be checked every other 4 years.